Go Find Your Own Tricks! This interview was drawn from a telephone conversation on 14 September 2006, building upon a previous email correspondence on 8 August 2005. Tzvi Avni was at his home in Jerusalem and Bob Gluck was in Albany, New York. Originally published online by the EMF Institute, a subsequent version of “Interview with Tzvi Avni” was published in Array (International Computer Music Association, 2007–08). Tzvi Avni (*1927) is one of the pre-eminent composers in the history of Israel. He was born in Germany in 1927 and immigrated to Israel in 1935. He studied composition with the major Israeli composers of the previous generation and subsequently visited the United States in 1963–64. While in the United States, Avni studied at the Tanglewood Music Center with Aaron Copland and Lukas Foss, and at the Columbia-Princeton Electronic Music Center in New York City. Upon his return to Israel, Avni taught at the Jerusalem Academy for Music and Dance, where he opened an electronic music studio in 1971. It became the second studio in Israel. Tzvi Avni has won many of the major artist awards in Israel, including the coveted Prime Minister’s Prize (1998) and the Israel Prize (2001). [Bob Gluck] What brought you to the United States? [Tzvi Avni] I came to the United States at the end of 1962, with my wife Pnina. I didn’t really know what I was going to do there. I only knew that New York was an important centre of new ideas and that it offered a wide variety of activities that might be of interest to me. I did know that I wanted to find a way to learn about what was going on in the world. After World War II, the Israeli War of Independence and the difficult economic situation in the years that followed, we in Israel were cut off from the rest of the world. In the early 1960s, Israelis of my generation were eager to seek ways to find out. How did you learn about the Columbia-Princeton Electronic Music Center? Once I arrived in New York, somebody arranged for me a meeting with Edgard Varèse. He asked me: “What can I do for you?” He listened to a few tapes of my work and he said “It’s very good. You are a composer. Do you want to learn my tricks? Go find your own tricks! Go to Columbia University.” Varèse then spoke with Luening, who met with me, listened to a few of my compositions and spoke with Ussachevsky, who enrolled me in the course of study at the Columbia-Princeton Electronic Music Center. With whom did you study, while at Columbia-Princeton? Vladimir Ussachevsky was our teacher. We didn’t see much of Otto Luening. Mario Davidovsky was already quite a dominant figure and already a veteran. The technical instruction, though, was done by Andres Lewin-Richter. The students that year, 1963–64, included Walter Carlos, İlhan Mimaroğlu 1[1. [ See Bob Gluck’s interview with Turkish composer İlhan Mimaroğlu in this issue of eContact! ]], Charles Wuorinen and Harvey Sollberger. We met once or twice a week for a couple of hours. We would analyze pieces and speak about them. Then Davidovsky and Lewin-Richter would teach us the how-tos. Individual work was with Lewin-Richter. Later, at the end of my time at Columbia-Princeton, when I was finishing my work Vocalise, they gave me the keys and I would stay on my own all night long. What recollections do you have about Vladimir Ussachevsky? Vladimir Ussachevsky was a very kind and nice person. He was of course one of the pioneers in the field and when I was with him, he was already summing up his life’s work. He was much more into concrete sounds than electronic sources, even though he was the one who developed the RCA synthesizer lab. He was a founder of the basic language using splicing and the other tape techniques. He was also a more conservative musician than the students, such as Mario Davidovsky and Charles Wuorinen, who were very much into serialism and other approaches. What did you learn from Mario Davidovsky? Mario Davidovsky was a very bright person and a gifted musician, one with very definite opinions about what is right and wrong in music. Structure and accuracy are very important for him. Not a fan of loops, he thought very carefully about sounds, how they were worked out and placed in a piece. What other recollections do you have about Columbia-Princeton? It was a time of trial and error and everybody was looking for new ideas and techniques in order to find a language for themselves. I remember playing my Vocalise to Walter (later Wendy…) Carlos, who was highly enthusiastic about the piece. Altogether, I worked in the studio for a year and a half. Babbitt was already working with the Mark I Synthesizer and we were invited once to see that instrument. It was as big as a room. It seemed to us like the Eighth Wonder of the World because we were used to do everything manually by splicing, mixing, filtering and so on, but this wasn’t necessary with the Mark I. What was it like for you to be in New York City? Were the other places you visited while in the United States? During that year, I also spent a month working with Myron Schaeffer at the University of Toronto on a scholarship from the Canada-Israel Foundation. This was two or three years before he died. He had the multi-track machine that Hugh Le Caine built. You could choose any loop you wanted for the mixer — and it had a keyboard. When I returned to Columbia-Princeton, I told them about it. Mario Davidovsky said that that if it has a keyboard, it’s not for me. Did you have contact later with any of the people you met at Columbia-Princeton? The only people with whom I met many years after the course was Mario Davidovsky, who visited Israel a few times and once, İlhan Mimaroğlu, who seemed very frustrated with music. Tell me about your electronic work Vocalise, which you composed at Columbia-Princeton. I remember hearing the sounds of the subway and this gave me the idea for the first sound in Vocalise. This was the period following President Kennedy’s assassination, quite a tense time in the world, a time of international concern. I think that the general atmosphere goes into everything people do, quite aside from compositional technique, such as splicing and mixing. What about the formal structure? Vocalise was principally a sonata. It has two themes, the voice and the electronic sounds. After they are introduced, they go through a series of variations and at the end, there is a brief reprise. I didn’t speak of the work as a sonata at the time because it was too conventional a category. But times change. In the development, the middle section, the material gets very tense. All of the sounds build up and reach a climax, almost like an explosion. I didn’t mean to imitate the sounds of an explosion; but I wanted a build up of something that was very tense. I had recently read George Orwell’s novel, 1984, and was thinking about some of the forces and trends that were affecting modern society negatively. What were the lasting influences of your studies in electronic music? I think that my experience with electronic music changed much about my approach to musical thinking and it remains with me even today. I became involved in more abstract ways of thinking about sound, not only as a component of harmony or melody, but as something with its own meaning. And of course, my mind became changed about noise, its qualities and possibilities. While we in Israel were influenced by Impressionism, I learned about a new way of approaching texture in New York and I encountered new, less linear ways of looking at development. My earlier works were generally in Classical forms, such as rondo and sonata. What I learned about electronic music influenced my later works and not just those with electronics. You mentioned Aaron Copland’s comments about what it might be like to return to Israel. What was your experience like? Indeed, after returning home from Columbia, it took maybe two or three years to adjust. The work that I completed a year later, my Meditations on a Drama, for chamber orchestra, was the product of collecting myself and assimilating the new ways of musical thinking that I learned at Columbia. You’ll find in it some influences from electronic music. I began to explore more open forms and I was much freer, more abstract in my formal thinking. This work was a first big step towards a more amalgamated approach for me. What electronic music works did you compose after Columbia-Princeton? I composed Collage (1967) for voice, flute, percussion and tape three years after returning from New York. Lyric Episodes (1972) for oboe and tape was composed originally for a ballet. It was included on a Folkways recording of electronic music from Israel in 1981. I composed Synchromotrask for female voice, tape and a door in 1976, A Monk Observes a Skull for mezzo-soprano, cello and tape in 1981, and Five Variations for Mr. K. for percussion and tape followed, in 1982. I think of Vocalise, Collage, Lyric Episodes and Five Variations for Mr. K. as the most important of these works. What was the influence of Columbia-Princeton on how your taught electronic music? When it came time for me to put together a studio at the Jerusalem Academy, the model in my mind was Columbia-Princeton. I gave a weekly lecture with examples from works, which we would analyze. We would listen to music of different types. We also had a technician who worked with the students. It was the most logical approach to take: to work with the students more theoretically and then give them a chance to try and create a piece. They had to do this at the end of each course. Every student at the Academy had to take the electronic music course. This became the policy when I was the head of the theory and composition department. There were less enthusiastic than others, but students created all sorts of pieces, some of them even funny. I believe that students should have the experience of composing all types of music, including twelve-tone, and gain some degree of understanding. For more information about Tzvi Avni and electronic music in Israel, refer to the author’s articles “Fifty Years of Electronic Music in Israel” in Organized Sound 10/2 (August 2005) [also see a shorter version of this article in eContact! 11.4 — Toronto Electroacoustic Symposium 2009 (TES) / Symposium Électroacoustique 2009 de Toronto (December 2009)] and “Electronic Music in Israel,” published online by the EMF Institute in 2005. Bob Gluck is a composer, pianist, historical writer and educator. 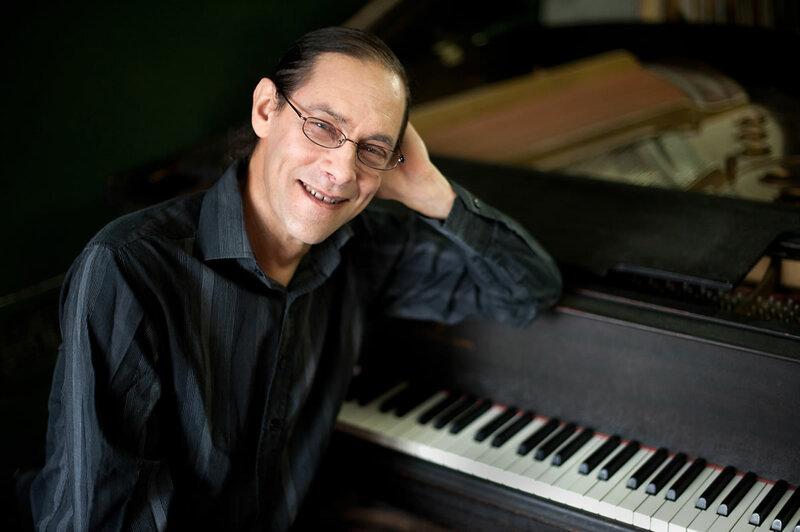 His music spans jazz performance, free improvisation and avant-garde concert music. Gluck is Associate Professor of Music at The University at Albany, where he directs the Electronic Music Studio. He has released three recordings of electroacoustic music (EMF Media) and three with a jazz trio (FMR Records). He is author of You’ll Know When You Get There: Herbie Hancock and the Mwandishi Band (University of Chicago Press, 2012). His essays have been published in Leonardo Music Journal, Organised Sound, Computer Music Journal, Journal SEAMUS, Leonardo, Living Music Journal, Ideas Sónicas, Tav+ and at the EMF Institute.